Beautiful architecture, but it's not quite as clean as this early photo. Spotted your post on twitter and felt I had to comment. I visited the bus station, for the first time in several years, last week. I have to say I was quite shocked. 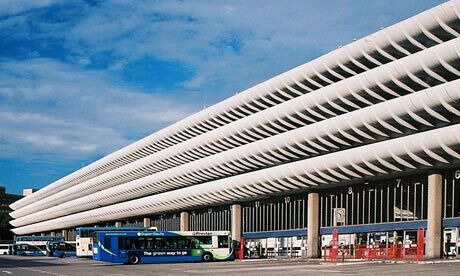 The bus station was always a brilliant solution and the underpasses and bridges to the Guild Hall excellent. Now sadly it felt very run down. The underpasses felt quiet, dirty and almost scary, leading to the shopping areas which again are full of empty units and pound-shops. Has the Tithebarn project meant that spending has been limited on the bus station as it really looked in a sorry state, both above and below ground. Karen you may have been slightly misconstrued ! Well the photos looked splendid but they belie the reality. You have to admit it is dingy dirty and looks very run down. It s not a great intro to Preston in my Opinion. maybe with a HUGE make-over it could be redeemed !!!!! I particularly like the textured floor finishes of the concourse and underpasses - of all the different types of chewing gum shapes on the tiles and flags, its so contemporary and artistic. I hope they save a few flags for the museum. Isn't it a case of architecture buffs waxing lyrical? Fine in the abstract, but unloved and impractical in reality.